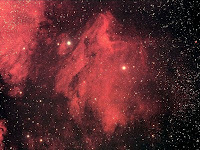 Following NGC 6940 I decided to give the Pelican Nebula a try. This fitted nicely in the field of the apo and I managed to get 8 decent subs before cloud brought the session to an end. Details: WO Megrez 88 + Baader MPCC. 8x 7 minute exposures with CLS in DSS & XAT Image Optimiser.